Now onto that fantastic burger!!!! I absolutely love a good BBQ burger so thats what I decided to go with for my first use of Pastamores' Kentucky Bourbon Sauce. In an effort to make it a bit healthier then a typical burger, I used lean ground turkey and whole grain sandwich thins (my new obsession). I simply season the meat with salt, pepper and garlic powder; allowing the BBQ sauce to flavor the burger. This sauce adds a really unique full bodied flavor that is so different then any BBQ sauce i've ever had! Love it!!! This burger is topped with sautéed onions and cheddar then pressed on the panini press. Absolutely delicious! 1. Add a few drizzles of olive oil to a sauté pan over medium low heat. Add the onions and cook until golden. 2. Place the turkey into a bowl and season with garlic powder, salt and pepper. Form into 3 even sized patties. 3. Brush the BBQ sauce on the patties. Cook for a few minutes on each side on a very hot grill. Do not worry about them being cooked all the way through, they will continue to cook in the next step. 4. Remove from the grill for assembly. Place some cheddar on the bottom half of the sandwich thin. Place the burger on top. Top with the onions and more cheddar then the top of the thin. 5. 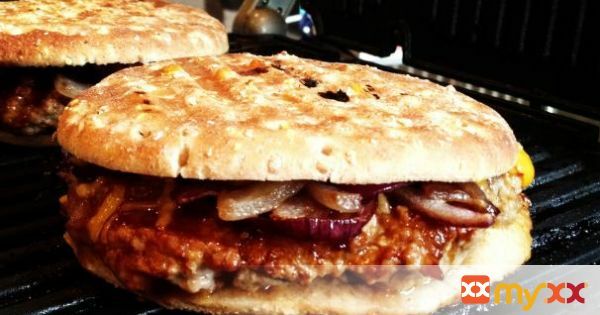 Place onto a hot panini press until the cheese is melted, bread a little crisp and the burger cooked through. Yummy goodness right there!! !